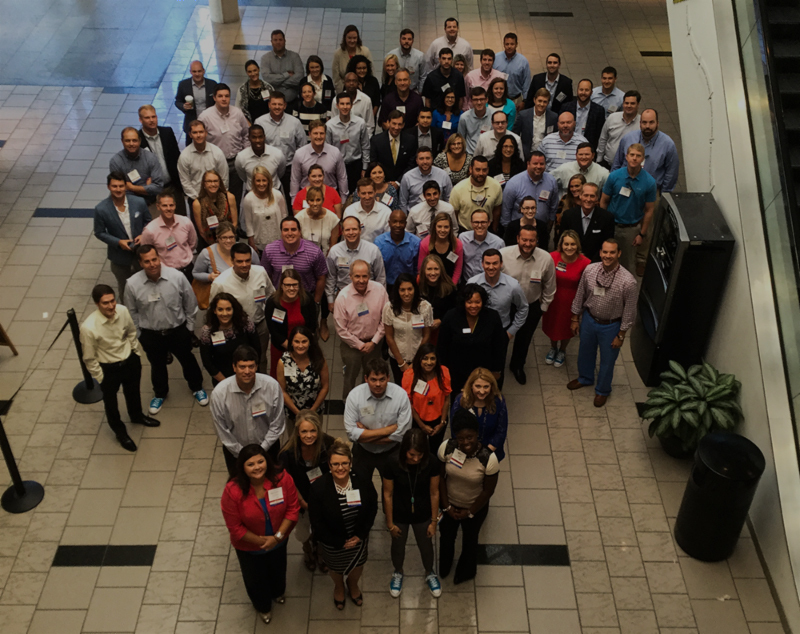 Join the NC Young Bankers! The North Carolina Bankers Association (NCBA) announced the formation of the North Carolina Young Bankers (NCYB) in late 2015. The NCYB was developed to identify and foster the professional development of emerging leaders in North Carolina’s banking industry. Becoming a member of NCYB provides access to regional and state-wide networking events, educational resources and leadership opportunities. Members of NCYB will support the overall mission of the NCBA, serving as advocates for the industry as well as promoting financial literacy through working with youth in North Carolina. Members can give back to the communities in which they serve through coordinated financial literacy efforts which include tools to help members teach our future generations at your bank or in local schools. Thank you for your interest in the North Carolina Young Bankers! To enroll in the Young Bankers Group, click here to sign up. You will be prompted to either enter in your portal account information, or create an account. Once signed up, you will have access to the full listing of NCYB members (“NC Young Bankers Group Members”) on your portal profile under “My Reports.” If you have any questions or need assistance with creating your profile on the portal, please contact Vickie Bowers (vickie@ncbankers.org). If you have questions specifically related to the NCYB, please contact Blair Jernigan (blair@ncbankers.org). To be the premier organization that develops and engages emerging bank leaders while strengthening our community. Keep an eye on this page and the NCYB Newsletter for future events! Do you know a particular Young Banker who exemplifies the NCYB’s mission? Nominate them using the form below and they may be featured in an upcoming edition of the NCYB Newsletter! Please ensure this is an accurate address to contact you. We may email you for more information or additional background on the nominee. Use this area to list the qualities and achievements that make this nominee a model Young Banker. Please include a brief work/education history and any volunteer work. We will publish this headshot in the NCYB Newsletter if your nominee is chosen for our spotlight. The Bankers in Schools initiative is a week-long program that allows schools from across the state to invite bankers of all ages in their communities to visit classrooms and teach a 45-minute lesson on budgeting. Volunteers will be trained and guided using a thorough curriculum that was developed by the North Carolina Young Bankers division, and is designed specifically for middle and high-school aged students. For any questions about the program, please reach out to Brianna Reeder at brianna@ncbankers.org. DONATE: The cost to sponsor one student to attend Camp Challenge for an entire week is $700, although truly any amount given helps tremendously. Last year we had nearly 400 applications come in from all over the state, and we remain hopeful that we will be able to accept as many campers as possible this year. Please consider supporting a middle school student in this experience that they otherwise wouldn’t be given the opportunity to have. VOLUNTEER: Throughout the summer, we will be looking for volunteers to help teach in our engaging personal finance course at Camp Challenge. Classes last from 9 a.m. – 12:30 p.m. each day (Monday – Friday). Volunteers are invited to stay and eat lunch with the campers immediately after classes at 12:30 p.m., and are more than welcome to participate in any of the traditional summer camp activities during the afternoon. If you are interested in visiting Camp Challenge, sign up to volunteer here! HOLD A DONATION DRIVE: We are always looking for more classroom items that we can use during the eight weeks of Camp Challenge. The most common items we use during the week are calculators, pens, pencils, markers, and construction paper. Additionally, each summer we are faced with a number of students who show up without some of the essentials needed for the week. These items include deodorant, toothpaste, toothbrushes, shampoo, body wash, and sleeping bags. If your bank is willing to hold a donation drive to bring in any of these supplies and/or toiletries, that would be a tremendous help. For more information on any of the ways you can support Camp Challenge, please contact Michelle Sutton at (919) 781-7979 or michelle@ncbankers.org.